Cricket. Cricket. Yes, I know…I kind of fell off the wagon last week and didn’t post a weekly activity guide. The struggle is real, and getting back from Thanksgiving and racing into all things Christmas got the best of me! However, tonight I am back, just in time, to share a few ideas for you and your little ones this week. (And remember if I skip a week again, because let’s be honest, it will probably happen, you can always reuse activities from before!). 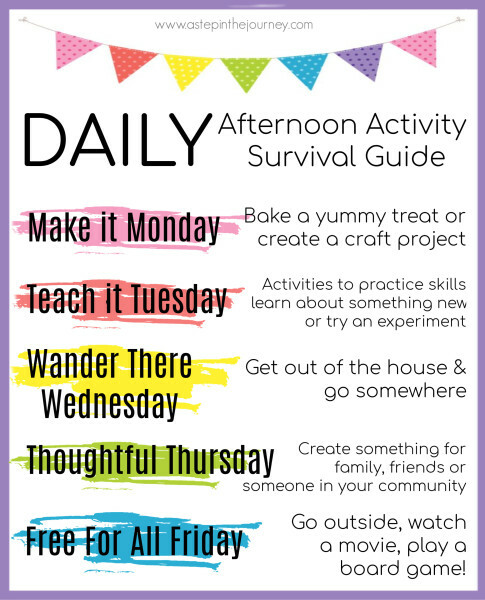 If you would like a copy of the daily afternoon activity survival guide framework, you can check it out here! 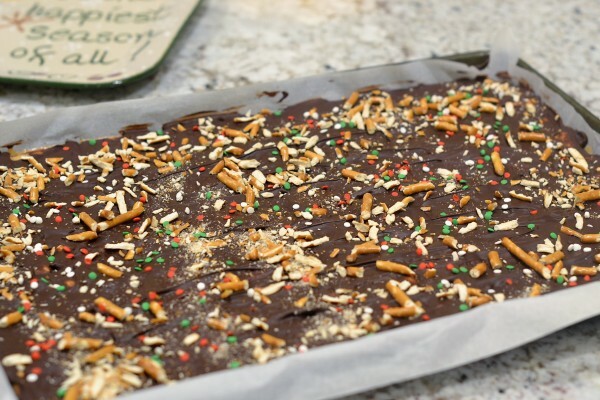 I did manage to share this recipe last week for Christmas Crack. It’s a must this Christmas season and your kids will love being a part of the fun. You could also have the kiddos make Christmas cards for neighbors and friends share the Christmas Crack with those your love. Giving is the perfect way to kick off the Christmas season. The Grinch is a classic Christmas book and movie. We wandered to the theater for the first showing and saved LOTS on ticket prices by going early. If you want to read more about the movie before taking your little ones (mostly to make sure you feel comfortable with them watching it), I suggest visiting Common Sense Media. This is a great website that offers reviews and incites into the plot and ratings. 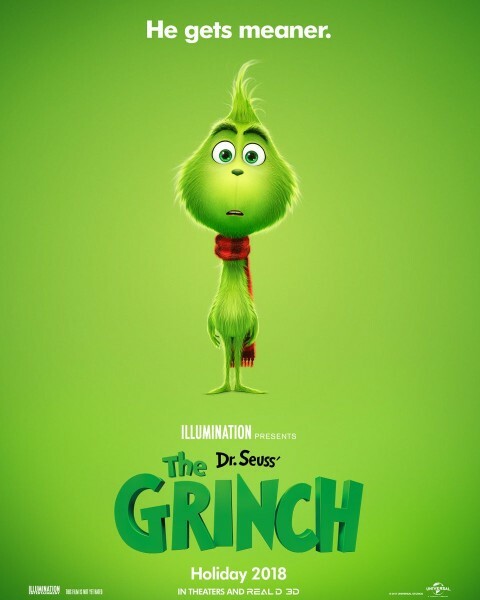 Common Sense said of The Grinch “Like Seuss’ original, this is a story about kindness, compassion, love, and generosity being the true meaning of Christmas.” The new film was a fun way to kick off the Christmas season. This week we are taking the candy cane challenge. 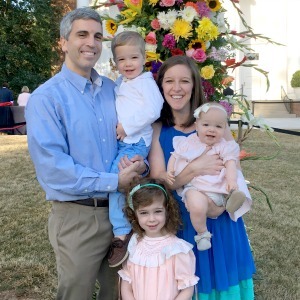 Years ago, Courtney DeFeo visited our MOPS group and talked about how she encourages her children to light others up. To make others feel special. Specifically, at Christmas time she and her children attach small notes to candy canes and pass them out to any and everyone they see. Everyone from your neighbors and preschool teachers, to cashiers or random/friendly faces at the mall. Your reach is wide! She has printables at her website or your can make your own. So add a few candy canes to your grocery list and share the light this Christmas season. Just let them play! It’s Friday….the weekend is coming. We are watching ALL the Christmas movies this month. Last week we watched The Polar Express and this Friday we plan to watch The Star! 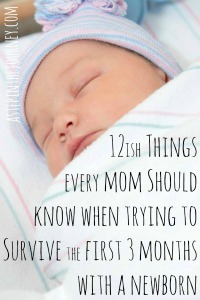 I hope you are able to implement some of these activities with your little one next week! I’d love to see pictures of your kiddos enjoying and you surviving your afternoons. Tag @astepinthejourney or use the hashtag #astepinthejourney if you share on instagram or Facebook! The stockings are hung, Alexa is turning my Christmas lights on and off when I ask her, Christmas crafts are being made, we have started our Jesse Tree Advent devotional, and of course, all the treats are being had! It truly is the most wonderful time of the year! I hope to share lots of Christmas love and fun with you over the next few weeks. Today, I have a good one! Want to be the hit of every party?? Make your neighbors feel special by delivering a Christmas treat? Encourage your child’s teacher your little one is their favorite?? I have a treat for you & I am sharing all the details today! 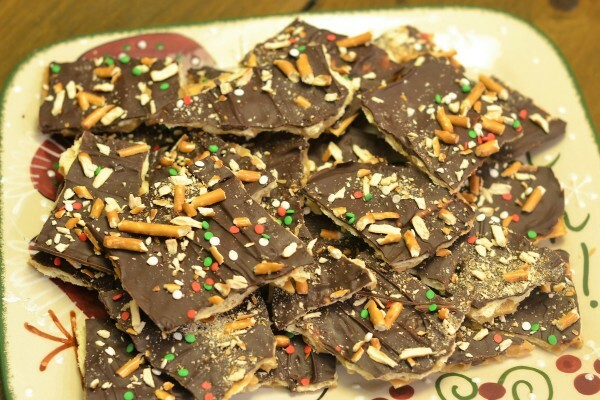 Meet CHRISTMAS CRACK. or Thanksgiving crack. or Valentines Crack….the list goes on. 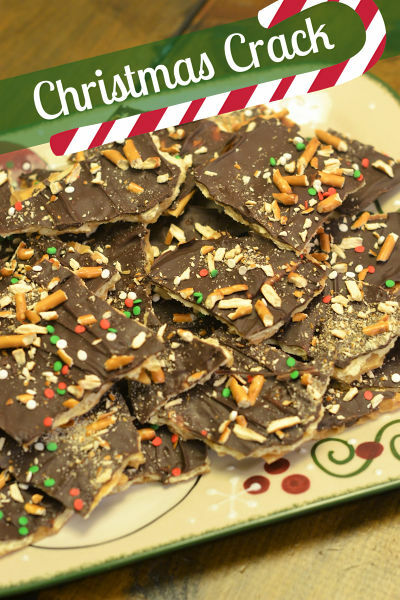 I promise anyone can make this yummy Christmas treat! You know is wouldn’t be an A Step in the Journey recipe if it wasn’t easy. So glance over these directions and get to work (you might even have all the ingredients in your pantry). The full recipe is at the bottom. In a medium sauce pan bring 1 cup of brown sugar and 1 cup of butter (two sticks…yes, TWO sticks) to a boil. Once brought to a boil you will want to boil for 3 minutes stirring continuously. 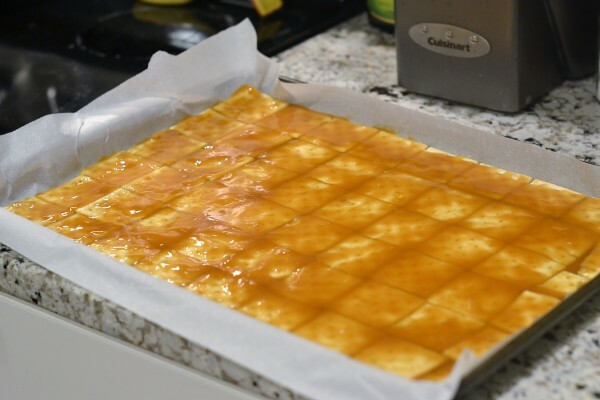 While you are waiting for the butter and brown sugar to melt, cover a large baking sheet with with parchment and clip down the edges to keep the parchment in place. Then line the baking sheet with saltines. You could do just one sleeve and call it a day, but I like to fill up the baking sheet so I usually need about 10 more crackers from a second sleeve. Once your sugar/butter mixture has boiled for 3 minutes and started to caramelize, pour it over the saltines and spread with a spatula. REMOVE your clips! Bake in the oven at 375 degrees for 5 minutes. Remove. Top with one bag (11.5 oz) of dark or milk chocolate chips. Let rest for 5 minutes and they will begin to melt. Then spread with the spatula. You can choose your toppings….mini M&Ms, crushed pretzels, sprinkles, nuts, toffee. You could also leave them plain. I’m pretty sure at this point, you can’t go wrong! 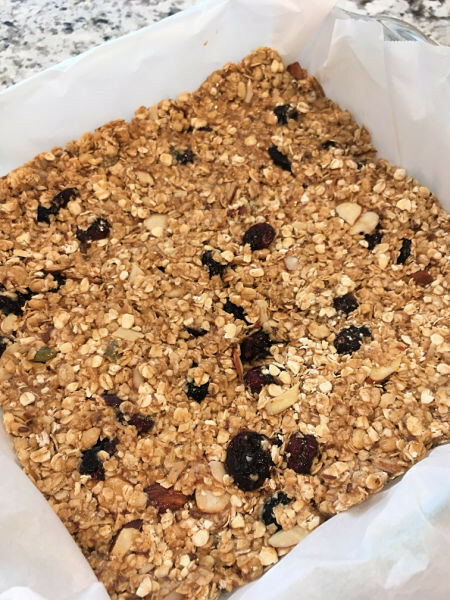 Refrigerate for at least two hours to give it time to harden. Then break into pieces. Bag it up for neighbors and teachers or arrange on a cute Christmas plate for one of your Christmas parties! Yall, it’s called Christmas CRACK for a reason. So have a plan, don’t leave it at your house for too long…or you will eat it all! You’ve been warned! Check out the full recipe below. Bring the brown sugar and butter to a boil in a sauce pan. Once boiling, boil for 3 minutes stirring continuously. 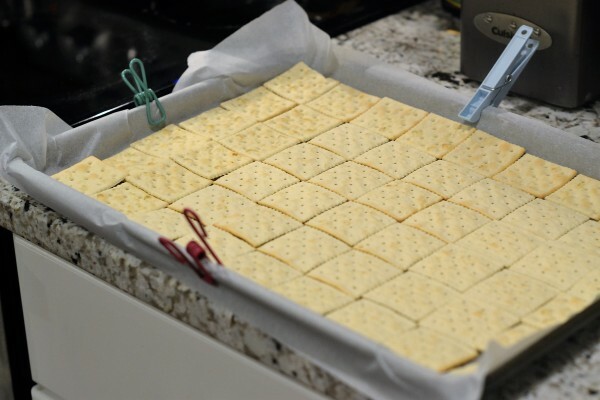 Line large baking sheet with parchment and spread out saltine crackers. Pour boiled sugar/butter mixture over saltines and spread with a spatula. 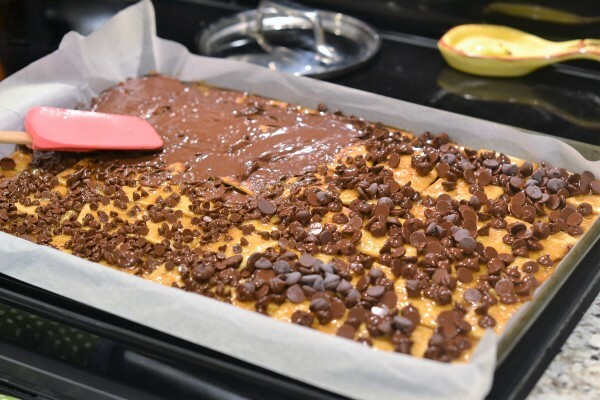 Remove from oven and pour 1 bag of chocolate chips over the saltines. Allow to sit for 5 minutes. Once they begin to melt spread with a spatula. Top with any toppings of your choice…M&Ms, crushed pretzels, sprinkles, nuts, toffee, etc. Allow to cool & set in the refrigerator for at least two hours. Break apart in pieces and ENJOY! It’s Thanksgiving week! And for us that means the kids are out of preschool ALL week. We have been wobbling around getting our turkey feathers ready. I wanted to share a few turkey ideas with you! I’m straying a little from the traditional daily activity categories, but we have extra time to fill around here so I thought an assortment of activities would be best this week! 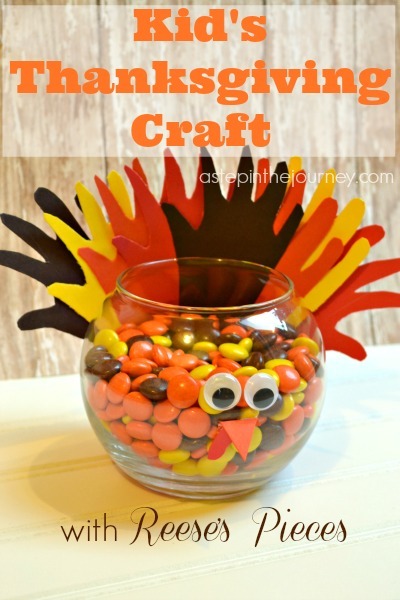 If you haven’t started your Thankful Turkey (thanks to Busy Toddler) yet, it’s not too late! 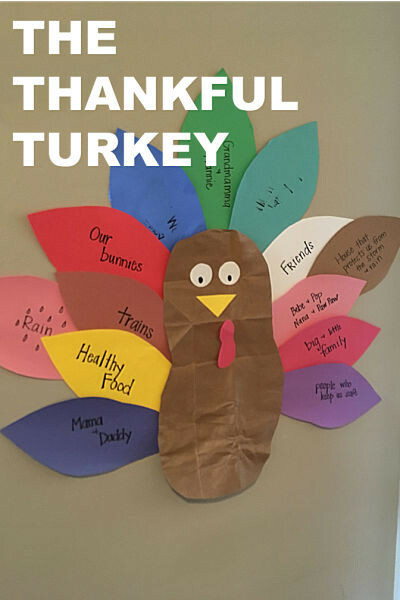 Add a feather (or two or three) a day talking with your kiddos about all you have to be thankful for. After cutting out all of our thankful feathers to have a stock pile for the month of November we had a lot of scraps. 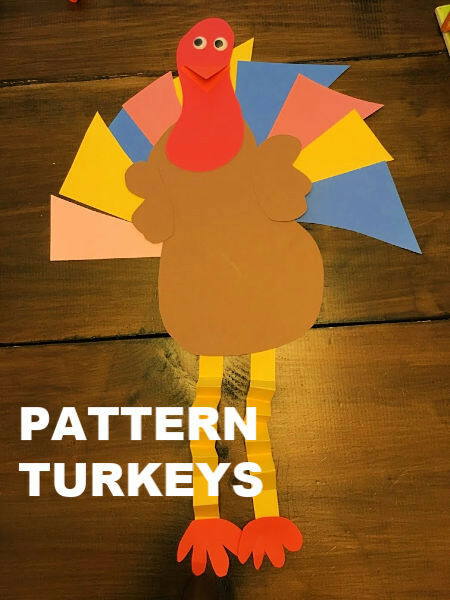 We used those scraps to make the feathers on these pattern turkeys. I drew out the body, head, beak, legs, and feet. Chickadee cut hers out…Sprout just glued his together. They worked on their fine motor skills by accordion folding the legs. Then they sorted through the scraps to create a color pattern for the turkey’s feathers. They turned out pretty cute! I love this idea of sticking feathers in a colander. Another great activity for fine motor skills from MamaOT. Go the the library and check out some books! Homeschool Preschool has some great suggestions. 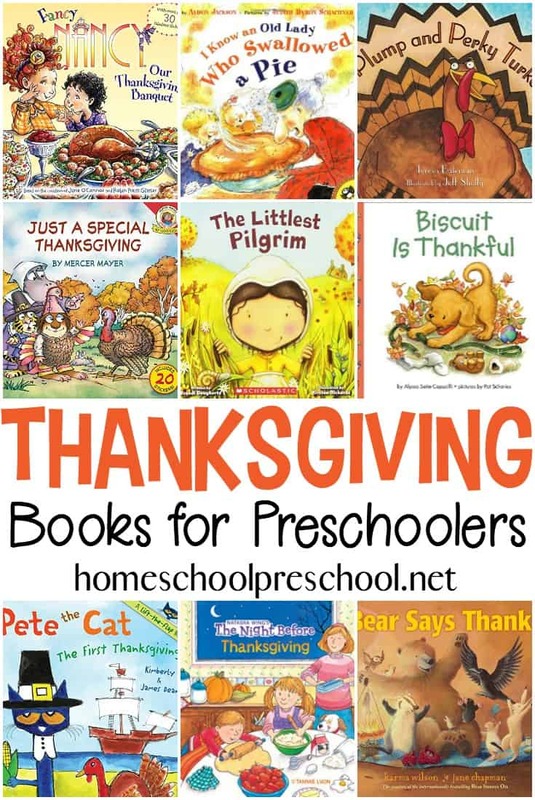 And last, let your little ones help with the Thanksgiving preparations. 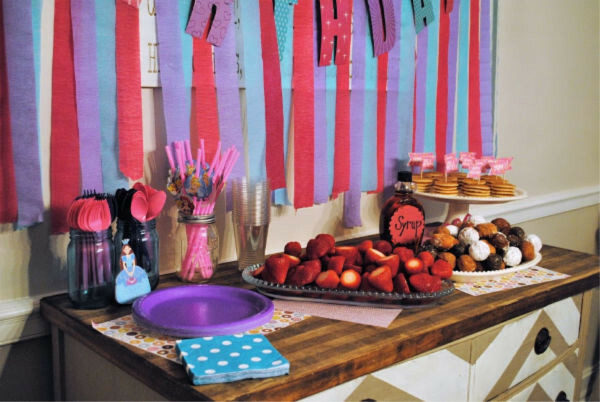 Make a banner, place cards on the table, prepare some of the side dishes or dessert. It’s all hands on deck this week! Happy Thanksgiving everyone! 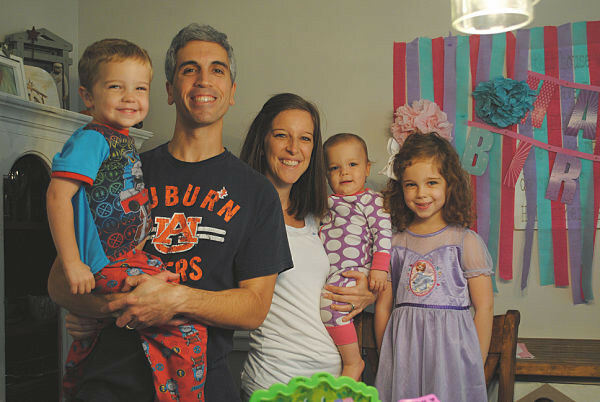 Last month our Chickadee turned FIVE. A whole hand (as she said all day!) The one that made me a mama is growing into an amazing young girl right before my very eyes. She is determined, kind hearted, level headed, smart, fun, inquisitive, fearless and a great big sister. We are so proud to call her ours and thankful God saw us fit to be her parents. It is such a privilege to see how God is working in her and through her to change the world. 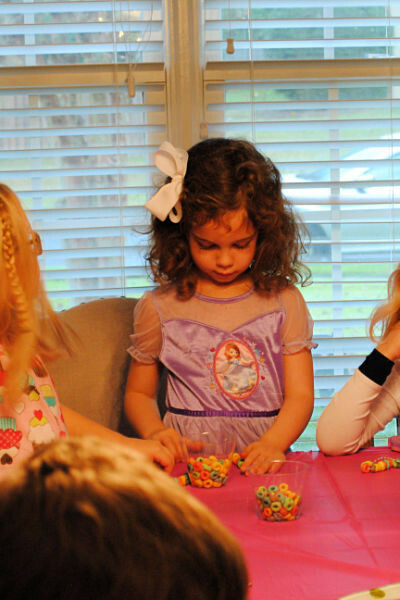 For her 5th birthday she wanted to celebrate with pancakes, pajamas, and princesses! So we invited a bunch of little girls and had such a fun time! The menu included pancakes, donut holes, fruit, and chocolate milk! Simple. Delicious. The the girls decorated pillowcases with fabric markers. I ordered these pillowcases and fabric markers from Amazon. They doubled as both a party craft and take home favor! Chickadee’s turned out great! We’ve washed it a few times too and the colors still look bright. I loved seeing all of the little girl’s personalities in the coloring. 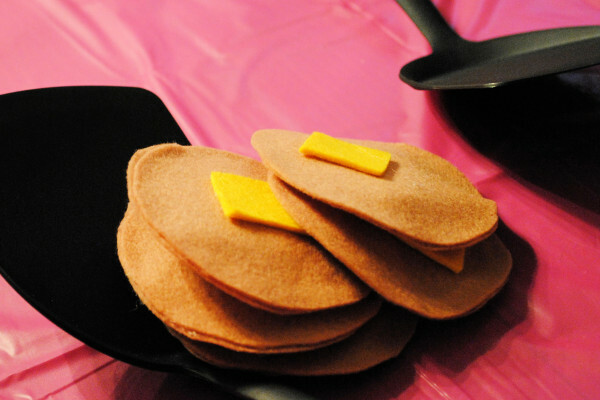 After the pillow decorating we made Fruit Loop necklaces and had a pancake relay using these felt pancakes and spatulas. And no birthday is truly complete without cake, right? 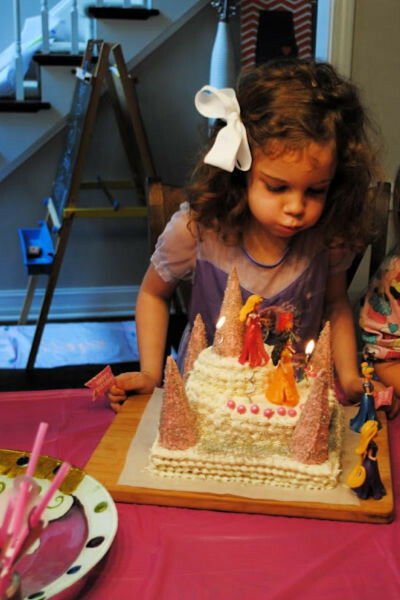 The week of her birthday Chickadee requested a princess castle cake. 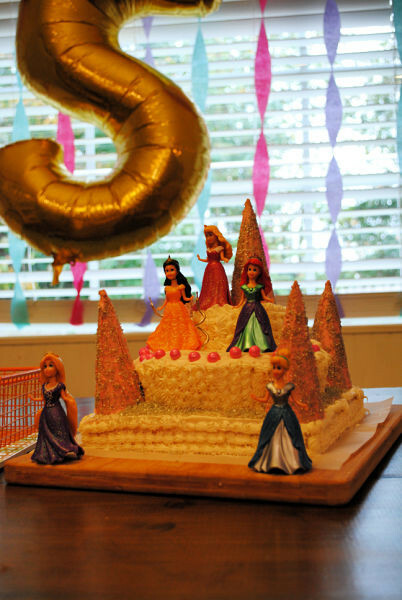 I must admit I was a little worried about exactly how I would pull that off, but after grabbing some different sized & shaped cake pans and her clip on princess, we made it work! The bottom is an 8×8 square, the middle a 7 inch circle, and the top a 4 inch circle. The turrets are made from upside down sugar cones covered in icing. Chickadee loved how it turned out and that is really all that matters! 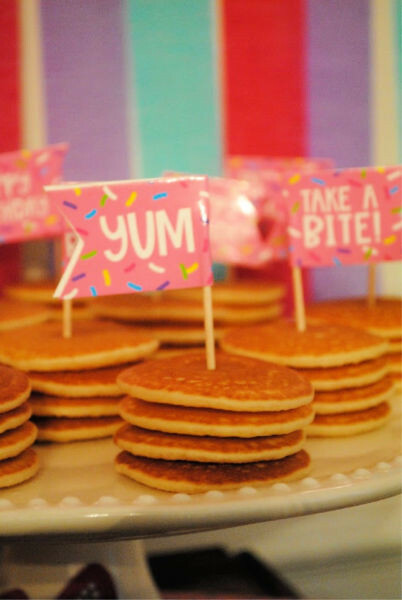 I bought most of our party supplies at the Dollar Tree…plates, napkins, banners, crepe paper, straws, pom poms, etc. The mini pancakes came from Trader Joes and the donuts are from Dunkin Donuts. Let me know if you have any other questions about where we bought what! We always have so much fun celebrating birthdays around here. Chickadee is the biggest celebrator of all! She loves a good party, and I think she had a blast at hers! Here is to being FIVE sweet girl! A. WHOLE. HAND. My kids are human garbage disposals. I thought this wasn’t suppose to happen until middle school? They are always hungry. Even on my best days when I make a full on breakfast of sausage, eggs, avocado, fruit, etc. the clock strikes 9:00 and they are starving again! I always like to have snacks on hand that I feel good about when handing them over to the kiddos. 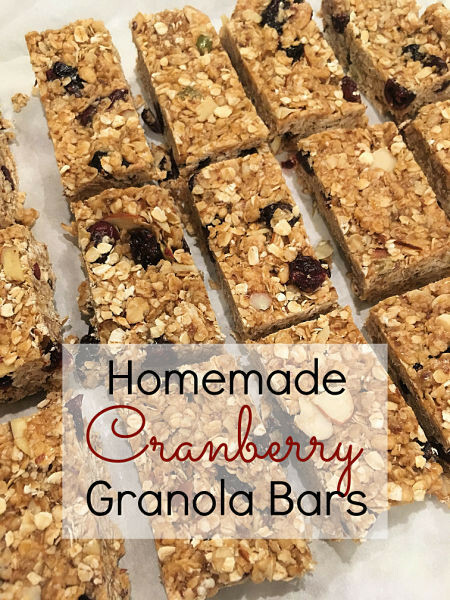 These homemade cranberry granola bars are simple, quick & taste better than any of the store bought options. Plus they are made with REAL ingredients! 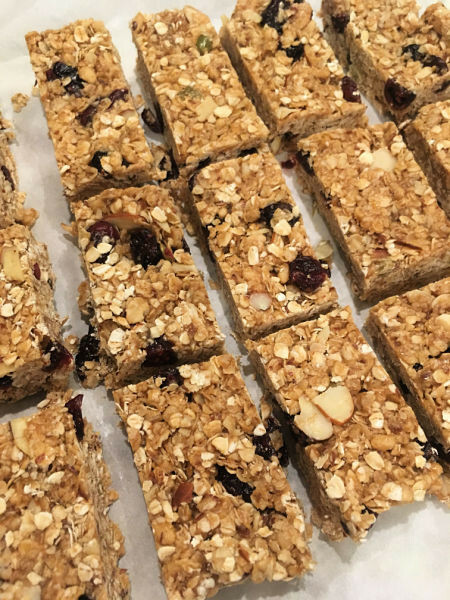 For the kiddos and myself they are a go to snack (along with these oatmeal balls). 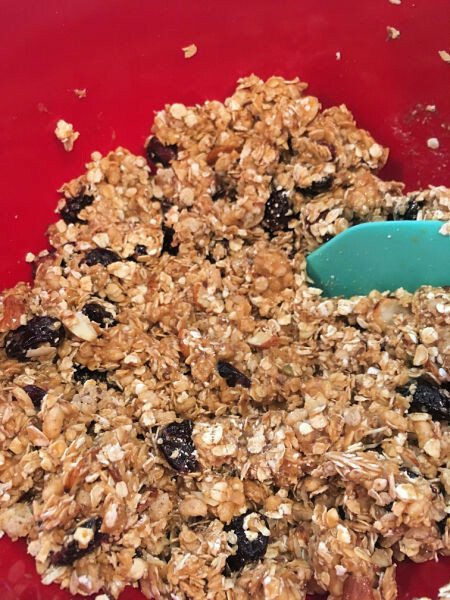 I promise your kids will love them (and if they don’t, swap the cranberries for chocolate chips…haha!). 3. In a sauce pan over medium-low heat combine honey, butter, brown sugar, almond butter, vanilla, and salt. Bring to a boil, then turn down heat and simmer until you see it thickening. Allow to cool for five minutes. 4. Combine the mixture with the dry ingredients and mix until fully combined. 5. Pour into baking dish and press down to fill evenly. 6. Allow to cool in the refrigerator for at least 2 hours. 7. EASILY remove from parchment paper and cut into pieces. Fee free to choose different add-ins in place of the cranberries. Some ideas are dark chocolate chips, raisins, coconut, or almonds. First, I LOVE parchment paper and silicone baking mats/sheets etc. They make clean up sooooo easy and nothing ever sticks to either of them. Jump on the bandwagon friends! 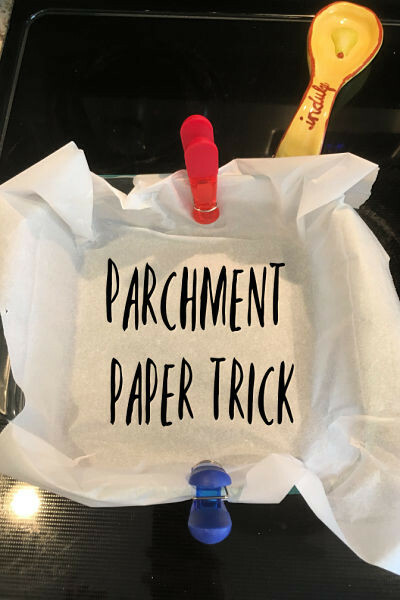 Okay, so my parchment paper trick….I do this with casseroles too! Place inside the baking dish and you will notice it will pop back up making it hard to pour your ingredients in. So, I always use chip clips or clothespins to hold the parchment down while I pour. After everything is in place, simply remove the clips & Voila!